Finally! It is here! I have Insurgent in my hands and I have read it! This book nearly caused Twitter/faction Armageddon, but it was definitely worth the wait. 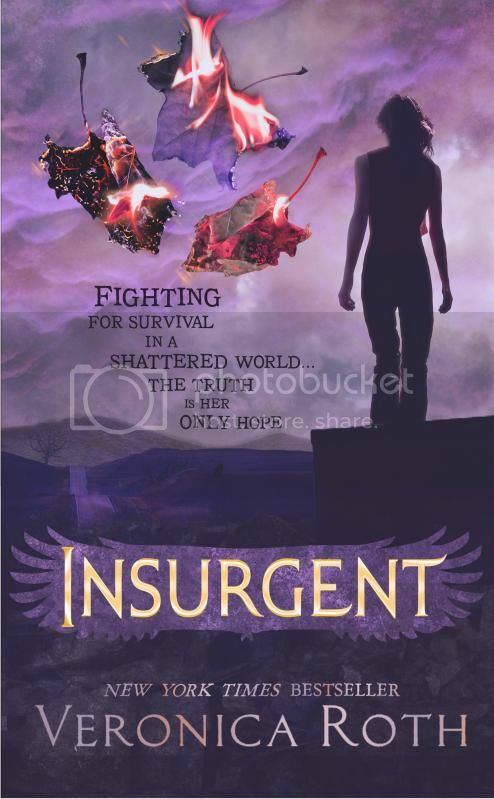 As you travel the blogosphere this week, you will see Insurgent reviews popping up all over the place, and I can put my hand on my heart and say this is definitely a series you want to read. If you haven't read the first book, Divergent, then read no further, quickly pop out to the nearest book store and buy it. In fact, save yourself a journey and buy both books at the same time! Here is my review of Divergent, to whet your appetite. Fleeing is a good word to describe this book. Tris and Four/Tobias spend a lot of time running from one disastrous situation to another as they try to stay one step ahead of the Dauntless traitors. Every faction seems to be in turmoil, as the factionless group watch carefully from the sidelines. Tris finds it difficult to know who to trust; the people she always thought would be on her side, seem to be missing when she comes under attack, while the people who scare her, come to her rescue. The whole situation has turned upon its head. The relationship between Tris and Tobias is really suffering and a wedge is slowly being pushed between them as it becomes obvious that secrets are being kept hidden. I found Tobias a little annoying in this book, because he just didn't believe the things that Tris was telling him. He was not the strong supportive boyfriend, I was expecting him to be, more like an older brother scolding his sibling for her immaturity. Tris may as well be a dart board, the amount of injuries she sustains in one book. Yet she bounces back from each and every one, which is surprising because of her suicidal thoughts at the beginning of the book. As the book drew to a close, I forgot I was actually reading. It felt like a movie playing out in front of my eyes. The writing described the action so well I could play out the pictures in my head. Three quarters of the way through the book a huge and shocking twist occurred, leaving me a little gobsmacked. The majority of readers with find this ending unbelievable. They will be stunned at how it ends. I actually saw it coming. The reason being was that it reminded me of one of my favourite films which I won't mention here, because if you have seen it, you will instantly know what will happen at the end. So I worked out what was going to happen quite early on, which was shame because it is a damn fine ending. I did enjoy Insurgent, although I am still not sure whether I love it more or less than Divergent. I found the writing really brought the tension of the situation to life. The present tense really intensified the speed of the story.There were enough shocks and twists to make me feel like a huge can of worms had been opened and sprawled all over the floor. I can't wait to see what happens next. A fast paced, thrilling fantasy that doesn't end when reality steps forward and slaps them in the face! Sounds like an extremely well written book. Given that you felt it read as though a movie was being played before your eyes, do you think a film version is likely? I am presuming that it will happen. Considering so many other YA books have gone that way. Thanks for the awesome review, Viv! It was TOTALLY worth the wait, and now I just want to read it again and again and reexperience the awesomeness! I do want to read it, but, well the whole idea about those 4 things annoy me a bit. I am not really one of them and to be one your whole life.. I've got to start this series - I'm so far behind! Oh my goodness, I'll have to read these. Great review. Glad you loved this one too! I must admit I loved Divergent just a teensy bit more, but this was pretty awesome too! I didn't see the ending coming at all!